We’ve read the glut of preservation blog posts about all the wonderful things an enterprising individual can put up to share with family and friends. And yes, I’m pretty much on the sharing bandwagon. I love the pleasure my food gifts bring to others, and knowing that it’s a continuing pleasure — that they open that jar of jam many mornings and feel the endorphin rush of deliciousness more than once — is honestly one of the greatest joys in my life. But blah blah blah, summer of love is over, ya hippie. This post is about the food I make that I DON’T share, the stuff that’s too good for others…or maybe too good for everyone except the one friend whom I deem might be able to sufficiently appreciate it. This is the selfish, food-hoarding side of the preservation movement, and I embrace that, too. And it has a name in my house: brandied apricots. These slightly tart, tangy, sugar and booze saturated little pillows of fiberous goo make even plain goat milk yogurt taste good. 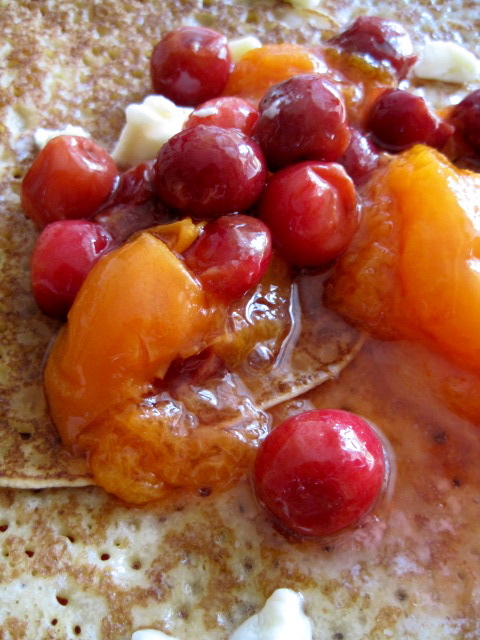 On crepes, with similarly brandied cherries, they are divine. 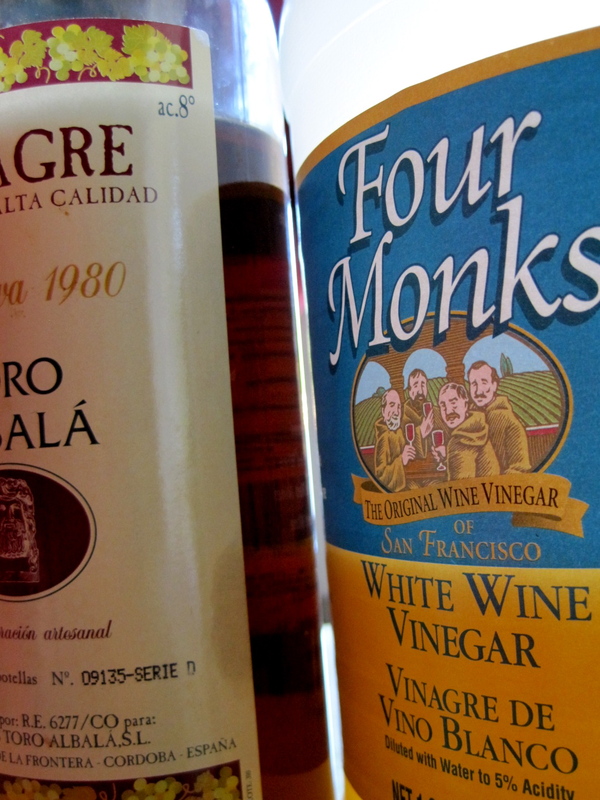 When I eat them during the day, I feel naughty, as if I just slammed down a Manhattan in my kitchen at noon. Just now, I was eating them, plotting to drive to eastern Washington as soon as the apricots hit the market, buying up a huge box and stuffing them in jars. More jars! More for me! Brandied apricots! All! Winter! Long! I also, for the record, feel this way about my loganberry jam, my green tomato pickles, and my dill pickles. So don’t even ask. What do you make for yourself and hoard? The tomato sauce I froze tastes so much better than the stuff I canned last summer. Why? Lemon juice, which is needed to keep the pH acidic enough to discourage microbes in the canned version, makes the canned sauce much more tart. 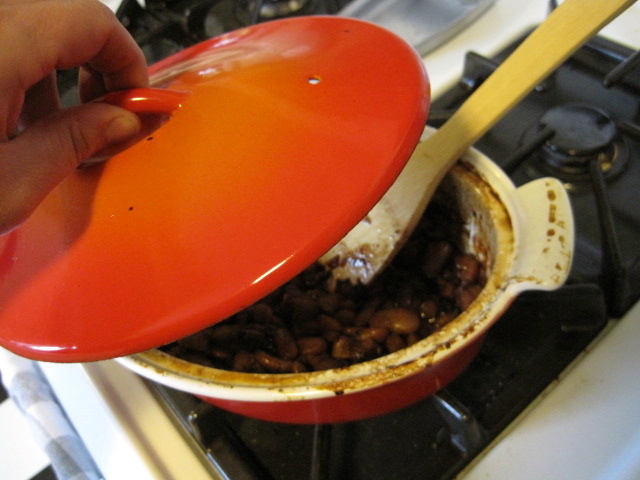 Plus, when you freeze sauce, you can add onions and garlic, and other vegetables or meat, with impunity. Canned tomato sauce is very useful in stews and soups. It’s a staple in my kitchen. But I wanted that pure taste of summer. I defrosted a container of frozen tomato sauce, thick and fragrant with onion and garlic. After heating it up, I smoothed out the flavor with a little half-and-half, and tossed it with penne, black pepper, and some blanched arugula and tender spring oregano from my garden. Summer! It will come. If you went out and snapped up the last bit of corn in this long, weird season, as I did, consider making vegan corncob broth for winter chowders. Inspired by the recipe in the excellent Paley’s Place Cookbook that I reviewed for last year’s EW procrastinator’s gift giving guide, I’ve been waiting all year. 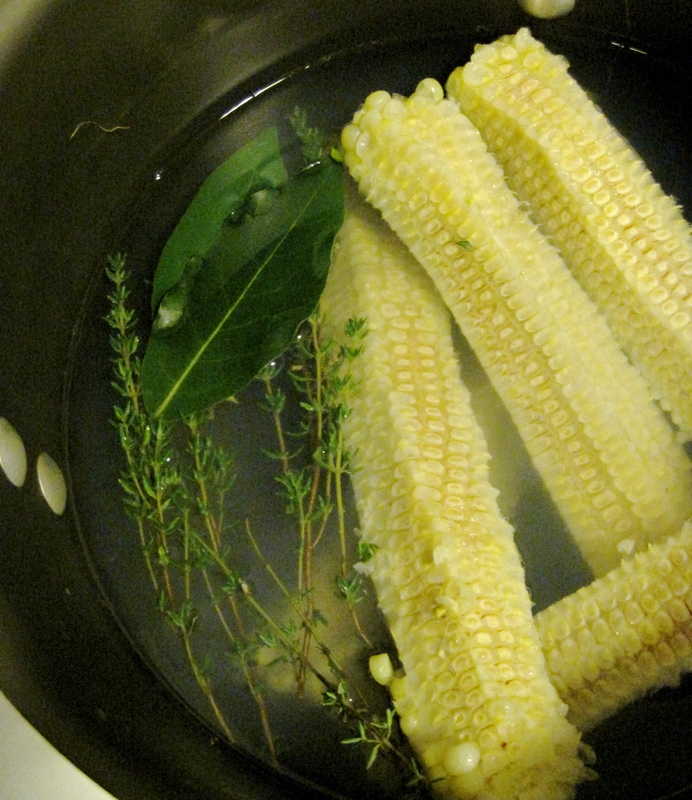 All you need to do is blanch the corn on the cob, remove the kernels for freezing, then let the corncobs simmer in salted water with some fresh herbs for about 15 minutes. I added bay leaf and thyme. There were 6-7 cobs to 3-4 quarts of water. You could even add some other vegetables or onions or garlic, I suppose, but the clean, corny taste of just the corncobs is perfect as is. Freeze in 4-cup containers for soups. This weird summer in the Willamette Valley didn’t seem to affect the peppers as much as the tomatoes. I’m not sure why, since peppers love heat even more than tomatoes, but we had a pretty decent crop. So…now is the time to cash in on peppers. I do this by making the quintessential roasted red pepper spread of the Balkans: ajvar. Ajvar is a mix of all the red peppers you can get your hands on, plus eggplant and garlic. Sometimes, other vegetables and herbs are added. In Eastern Europe, they use the elongated, thick-skinned pepper varieties that have a bit of heat to them. The peppers must be completely ripe and dark red. 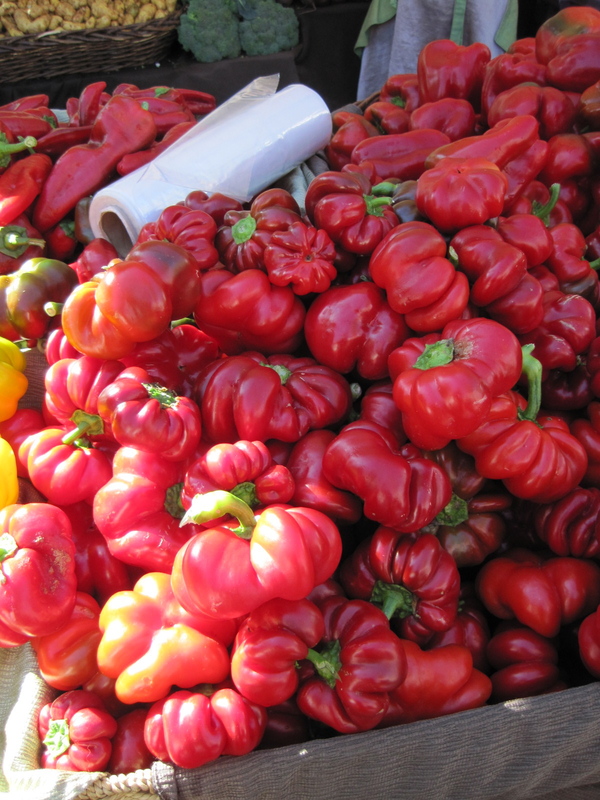 The peppers pictured above are what we see most frequently in the Eugene farmers’ markets — choose the conical ones pictured in the upper left corner for most Balkanesque results. They’re easiest to roast. Once you’re collected all these peppers, you roast them over an open flame, and then peel them, purée them, and cook them down until the whole pot of mush is rich, heavenly, sweet and smoky spread. Uses for ajvar are legion. The best way, of course, is straight up, spread on warm bread and eaten with cheese. I like to serve it with meat, as well. I use frozen corn from earlier in the summer to make roasted red pepper and corn salsa out of it, and in the winter, I add it to vegetable soups or stews. 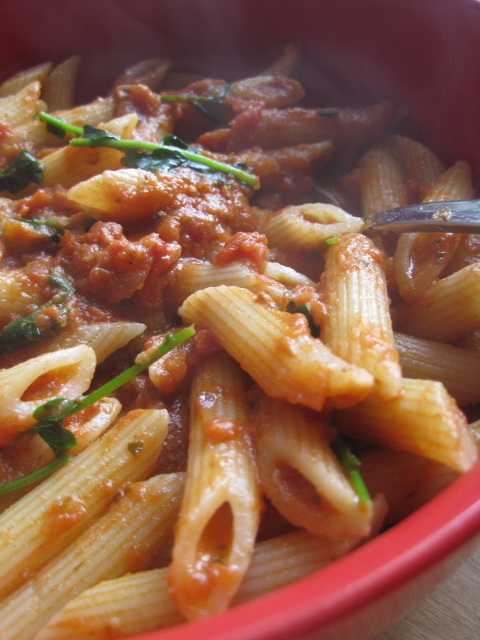 It’s great on pasta with a bit of cream and grilled chicken, or with mild white fish. 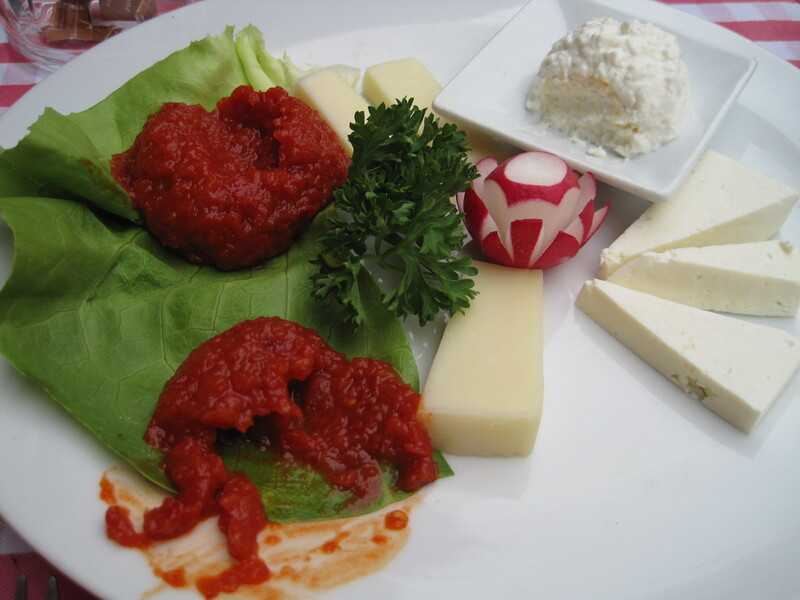 The top, pretty photo, is of ajvar I had in Prague this summer. It was accompanied by freshly baked bread and three kinds of cheese (a cottage, a feta, and a very mild Havarti-like cheese). I suspect that the brilliant ruby color of the ajvar means that it was 100% red peppers. It actually didn’t taste that great: no garlic, and possibly cooked peppers. 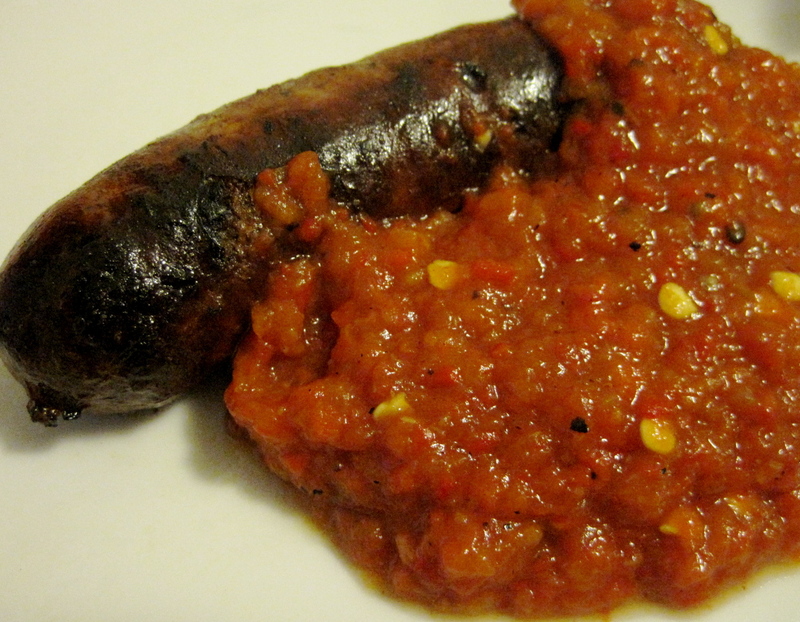 The ugly picture, on the other hand, is an unspeakably delicious combination: one of Del Del Guercio’s “stubs” sausages dressed with ajvar I made last weekend. Looks aren’t everything! Although the bad photo makes it look even more washed out than it is, the ajvar made with eggplant purée is always a bit more pale than red peppers. I like eggplant for the slight bitterness it adds. I also leave in tiny bits of blackened skin and a few seeds to add that umami flavor and some texture. And I use as many of my hot Hungarian peppers as I can collect. This year, I planted more plants than ever…then waited for months for them to ripen. Finally! Note: this spread, thanks to the eggplant and its thick consistency, is not safe to can. I’ve been trying to figure out a way to make it safe to put up, but didn’t get an answer in time for this year’s batch. I’ll update this post if/when I hear back from the Canning Powers that Be. 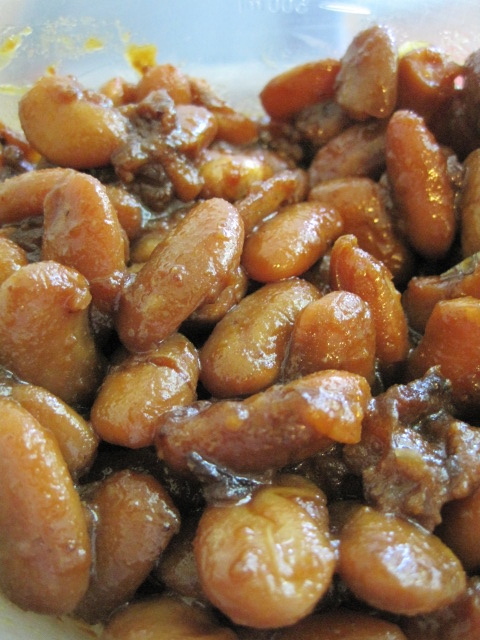 It can be very safely and profitably frozen, and the spread keeps for a week or so in the refrigerator. Enjoy, while you can, late summer’s last hurrah. Preheat oven to broil. Halve each pepper, discarding stems and seeds. Place peppers, cut side down, on an old baking sheet or one lined with foil. Cut eggplant in half lengthwise and score with a knife, drizzle it with about 2 tablespoons olive oil and a little salt and place it on a second baking sheet. 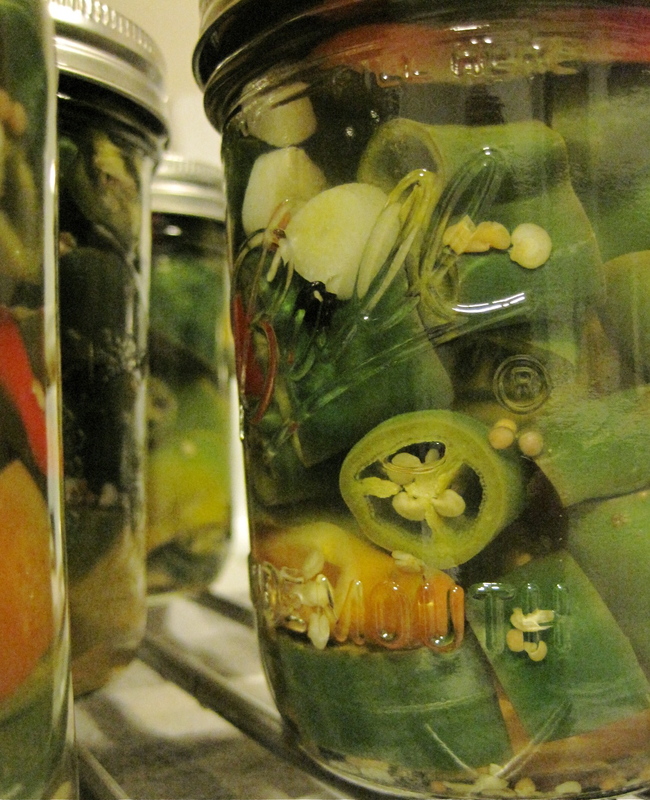 Place one of the oven racks roughly 3 to 4 inches below the heat; place peppers on this rack. The eggplant should sit on a lower rack. Broil the peppers and eggplant, turning the peppers occasionally until they are well roasted on all sides, roughly 15 to 20 minutes. The eggplant may be done [ed., meaning cooked until soft] first; if so, remove it and set it aside to cool. The other option is to grill your peppers on a BBQ grill. I prefer this, as it adds smokiness. Wrap the eggplants in foil after poking them a couple times with a fork, then place them on the coolest part of the grill. Watching carefully, grill whole peppers just until the skin blisters and slightly blackens. You just want to be able to pull the skin off, not blacken the entire pepper. Remove peppers and place them in a bowl, then cover the bowl tightly with a plastic bag so the peppers steam and the skin loosens. Cook the eggplant until soft, turning it often. We find that if we cook eggplant after grilling whatever it is we’re making for dinner, leaving it to sit on the coals with the grill cover on for about 30 minutes, it gets completely soft and nicely smoky. Allow the peppers and eggplant to cool enough to handle. Remove the blackened skin from the peppers, then de-stem and seed the peppers. Cut them in quarters and set aside in a bowl. Remove the pulp from the eggplant with a spoon, carefully pulling the seed section from the flesh. Discard seeds. Add peppers with the accumulated juice and garlic to food processor. Pulse until the peppers are chopped into fine pieces, then add eggplant pulp and purée. Add vinegar and salt and pepper to taste. You might also add a little sugar if the purée isn’t sweet enough. The purée can now be eaten, or, even better, cook it down for an hour or so at a simmer, so the flavors will be more concentrated. The flavor will improve if ajvar is allowed to sit in the refrigerator overnight. You may freeze (in 1/2 cup or 1 cup portions) or keep in the refrigerator for about a week.